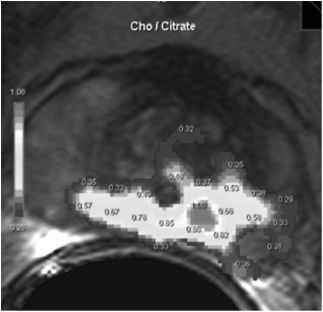 It is feasible to perform endorectal MR imaging at 3T in patients with prostate cancer, with the potential advantages of increased spatial resolution of T2-weighted and contrast enhanced MR images, increased temporal resolution of dynamic contrast-enhanced MR imaging and increased spectral resolution and signal-to-noise (SNR) of MRSI . 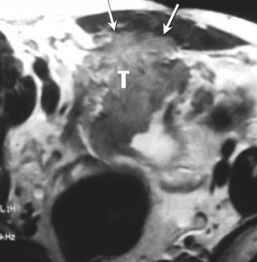 It is likely that imaging with an endorectal coil at a magnetic field strength of 3T will expand potential clinical applications in evaluating the prostate. The reported sensitivity and specificity for detecting extra-capsular disease was 88% and 96% respectively, which is an improvement compared to 1.5T (Fig. 8) .